We request commuters using strollers not to obstruct the path of other commuters. We also request other commuters to be understanding & mindful of those using strollers. Kindly refrain from entering the track area/ other restricted areas. You may come in contact of a running train or be electrocuted by high voltage electric lines. Stand behind the tactile line in a queue, at side and not in the middle of the same door. Allow passengers from train to alight first. Mind the gap between platform and train while boarding or de-boarding. Follow constructions of marshals stationed at the platforms. Stand facing the direction of travel while waiting at platform. Check the arrival time of your train from the digital signboard. Take care of your valuables, bags etc. Do not push your co-passengers while at the platform as well as entering the train. Do not stand in front of train door. Do not try to enter when train doors are closing. Do not smoke at station as well as inside train. 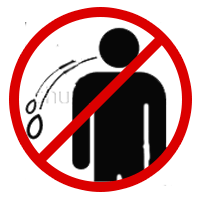 Do not spit/ create nuisance on station and platform area, stations and inside the trains. Do not step onto metro track or try to pick the belongings that drop on the track (contact metro staff for assistance). Do not eat or drink on station/ in train. Be patient, remain calm, you are safe. Press alarm or intercom button to call help. Always check there is no unattended or suspicious article lying anywhere within the coach or anywhere in station area. Train can move only if all doors are properly closed. Don't use passenger alarm between stops unless it's a real emergency. Do not block train doors while standing in front of door. Do not play music speakers on the train or at station. Do not sit on the floor of the train. Do not spit or write on the wall of car/gangway. Do not eat inside the car. Do not carry heavy back pack to avoid inconvenience to fellow passengers. Cooperate with the Metro staff in friendly frisking & security check-ups. Limit your baggage to 15 kg. Do not carry baggage exceeding 60 cm (Length) x 45 cm (Width) x 25 cm (Height) in size. Hold the handrail while using escalator, face the moving direction and put forward a step on escalator. Stand on left side of the escalators, while moving keep to the right. Keep feet within tactile line and from sides. Move away from escalator after reaching destination. In case of emergency, press emergency stop red buttons. located at the bottom, top & centre of the escalator. Hold children firmly. Do not use the escalator when it is not working. Running on escalator not permitted. Transportation of bulk and heavy loads not permitted. Use permitted only with footwear. Don't carry luggage on your head. Don't sit, run or play on escalators. Don't lean outside from handrail. Stand clear off doors. Step in only when it has stopped & doors have opened fully. Press your destination gently (indicator in button shows your call is registered; p: platform, c: concourse). Use door open button only when necessary. Preventing doors from closing delay service for other users. Follow the principle: last in- first out! Use emergency alarm/intercom button, only during emergency situations. Do not use elevators in case of fire, earthquake. Do not try to forcefully open the door. Do not stand unnecessarily in line with door movement. Do not try to enter when elevator doors are closing. Do not smoke inside elevator. Do not panic if you get stuck inside elevator for whatsoever reason. Be patient, remain calm, you are safe. Press alarms or intercom button to call help.